Why should I drive a Certified Pre-Owned Toyota? Quality, peace of mind, and a very competitive price! Drive new car confidence for a pre-owned price at Mountain States Toyota, serving Denver, Aurora, Lakewood and Boulder. Plus - It's a Toyota! It stands to reason that the better a product is made the longer it will last. Every Certified Pre-Owned Toyota is a recent model, low-mileage vehicle built to Toyota’s incomparably high standards. This makes getting a high-quality, low mileage Toyota at a great price a very savvy move. But a CPO Toyota offers more than just a great car at a great price. 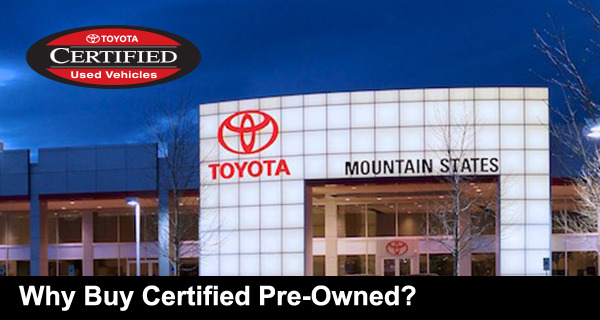 If you’re looking for the value of a pre-owned car with the quality of new vehicle, choose a Certified Pre-Owned vehicle at Mountain States Toyota, serving Denver, Aurora, Lakewood and Boulder in Colorado. Fill out the form to make an inquiry, or stop by Mountain States Toyota and choose from our wide range of CPO models at our state-of-the-art dealership.